The New 52: Did We Get What We Hoped For? It's been over a year since I laid out a mini-manifesto titled "What I Hope to See in the New DC Universe," and recently I began to reflect on how much of it has actually come to pass, and not. I couldn't the list exactly, though, and it seemed as good a time as any to take a look at the list, and see what, if anything, came out of it. The goal: Innovative and invigorating takes on characters whose die-hard fans spend a ton of time trying to sell them to us, but who haven’t had a successful book in years. The verdict: It's a split verdict on this one, folks. Aquaman is an unqualified success, but Hawkman and The Fury of Firestorm the Nuclear Men have been kind of a mess and after a few months of backup features, I'm still not totally clear on what's happening with Captain Marvel Shazam. The goal: A balance of simplifying a title and a character’s backstory with retaining the best elements and supporting characters. The verdict: It didn't work that well. There's been an uneven execution in the " simplifying" part to begin with, and that's tainted the rest, but as often as not we've seen a confusing blend of new and old content that's not exactly comforting to the old readers, but lends little to the new readers. Nowhere has this been clearer than in books like Static Shock and Green Arrow, where supporting casts were jettisoned and replaced with new ones that have been mostly forgettable. The goal: Speaking of supporting characters, let’s have some. The verdict: This has stopped just short of being an abject failure. In spite of a couple of books cleverly reinserting old DC Universe staples like Ray Palmer (Frankenstein: Agent of S.H.A.D.E.) and Cameron Chase (Batwoman) into the fold, most titles have spent almost all of their time on punching bad guys and very little on character development. Most of the titles that succeeded in doing this were the ones where it was coded into the DNA of previous versions, like Animal Man, but Superman, who has one of the best and most well-known supporting casts in comics, spent virtually no time on any of them this year. And while I'm the last one to demand that they roll out too much, too soon and run the risk of failing at all of it, there are characters whose fan bases obviously would have supported figuring out a way to get them into the show. The fact that Bart Allen exists before Wally West does seems wrong, and the absences of Donna Troy and Stephanie Brown have been felt. The goal: And the way to do that? Team books can be for teams and universe-level events. The verdict: Again, kind of a mixed bag. 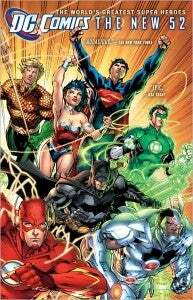 While the Superman titles and probably the overall majority of New 52 books managed to steer clear of big event stories for a year, and DC didn't immediately roll out a big summer crossover (they did Before Watchmen instead), Batman almost immediately dove into an intricate story that ultimately became a massive crossover tying in with the something like 10 books set in Gotham. The Green Lantern universe--which, like Batman, was only partially rebooted after Flashpoint--has been basically impenetrable to new readers, and we're already heading into The Rot--a crossover that was billed as just being a simple enough story between the OBVIOUSLY related titles of Animal Man and Swamp Thing, but which now seems to be reaching out into a number of titles, all of which had been doing pretty well at telling stories on their own up til now. The goal: Focus on more done-in-one stories or short arcs. The verdict: Not at all. Even the anthology title, which sees characters and creative teams come and go and is nominally a proving ground for characters who couldn't support an ongoing, has multi-part stories. Maybe they'll do a little better on this front with the National Comics format. The goal: An anthology series that has enough promotion, talent and whatever else it takes to SURVIVE. The verdict: So far, so good. DC Universe Presents still exists in spite of fairly low sales, perhaps suggesting that it's an editorial priority at DC. The goal: Speaking of anthologies, it would be great to have one digital book for like $10 that collects the week’s new releases, like what they have with the free preview booklet thing every week on ComiXology. If they could make it available as a black-and-white newsprint copy two weeks later or something to retailers for cheap that would be even better, but that’s looking backwards not forwards and not something that’s likely to happen. The verdict: No discount program of any kind is in place yet on current month's releases, although they've done extremely well offering this kind of product with their digital-only books. So that's better than I would have expected! The goal: A good weekly, and one that focuses on being Good as opposed to “Important” (again, likeWednesday Comics). New readers who are paying 1.99 or 2.99 for digital copies are likely going to rationalize it by likening it to the TV show model, where that’s the going rate for an episode. Great! But TV shows are weekly and comics are monthly. Launching in September, just as most popular TV shows are getting going again after their hiatus, means that digital consumers may get monthlies lost in the shuffle unless it’s a book they really fall in love with. Get a decent weekly going–even if it’s just re-purposed classic stories. I’d love to see 60-page, self-contained reprint stories coming out weekly for cheap. The verdict: They did this extremely well with some of their digital-first products like Smallville Season 11 and Batman: Legends of the Dark Knight. It's not the way I would have expected it, but their business model is remarkably close to what I had hoped to see. Also, they've been consistently good for the most part, as have the Ame Comi books and the Beyond line, from what the reviews are saying (haven't been reading myself). The goal: And speaking of the TV model, let’s go for something that has been almost completely lost to the direct market: Subscriptions, and subscription pricing. The verdict: Not even at all. The goal: And lastly (not because I don’t have more I’d like to see but because I’m starting to drift dangerously away from the “IN the DCU” part of the question), I’d like to see broader support for non-Apple devices in the app store/digital comics marketplace. The verdict: Pretty good, but still not perfect. the standoff between Barnes & Noble's Nook and ComiXology benefits no one, but we've seen the day-and-date comics through ComiXology reach out to most other formats and I think everyone supports DC's collected editions by now. Not bad, all in all. A lot of middle ground, and almost as many successes as outright failures--and all that in meeting objectives that were set forward by a columnist nobody at DC has any interest in listening to! Score!